While VMware vCenter provides a centralized platform for managing across the hybrid cloud, an expired certificate can turn into an IT nightmare. Recently, one of our clients experienced an issue with VMware vCenter 6.5. The platform became unavailable because the certificate expired. This expired certificate was not self-signed or automatically created during new vCenter installation, but instead issued by a trusted certificate authority (CA). Dasher’s expert engineers recommend replacing the certificate on your vCenter and checking the expiration date to prevent a vCenter outage. When a vCenter machine certificate expires, most communication and services will not work properly and fail to function (due to multiple services that are assigned to use that certificate for secure communication). In this case, our client could not login vCenter, manage it and other third party integration plugins, or backup software failed with tasks. Below are the steps our Dasher engineers followed to recover VMware vCenter 6.5 to fully functional state. With some minor changes, they also may be considered for any vCSA version from 6.0 to 6.7. Login to vCenter vCSA via SSH. Type shell and press Enter. Run /usr/lib/vmware-vmca/bin/certificate-manager. 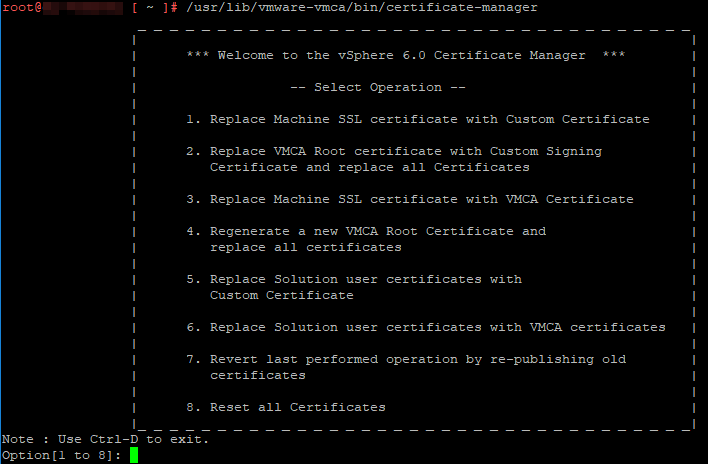 You will see vSphere Certificate Manager with multiple options to select. Engineer’s note: In case of an emergency, no accessibility to issue a certificate, or your previous certificate was VMware self-signed (typically certificate valid for 10 years): You may try to revert back by choosing option 7 of Certificate Manager. This will replace the expired certificate with the previous configuration and will make your vCenter functional, so that you may proceed with steps below later. 3. Enter SSO and VC administrator credentials (default: administartor@vsphere.local). Then again, choose option 1 to Generate CSR and Keys for Machine SSL certificate. 5. Type Yes to proceed. 6. 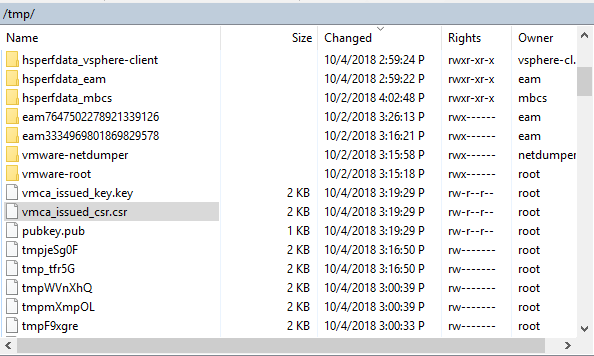 Signing request and private key is generated and located in /tmp folder. 7. Download /tmp/vmca_issued_csr.csr file with any tool you use, i.e. WinSCP. 9. Go and submit your CSR file to your certificate authority (CA). Engineer’s note: If you have one or more intermediate certificate authorities, the root certificate file should be a chain of all intermediate CA and Root CA certificates. Additionally, machine certificate files should be a full chain for certificate, intermediate certificate(s), and root certificate. 13. Choose option 1: Replace Machine SSL certificate with Custom Certificate. 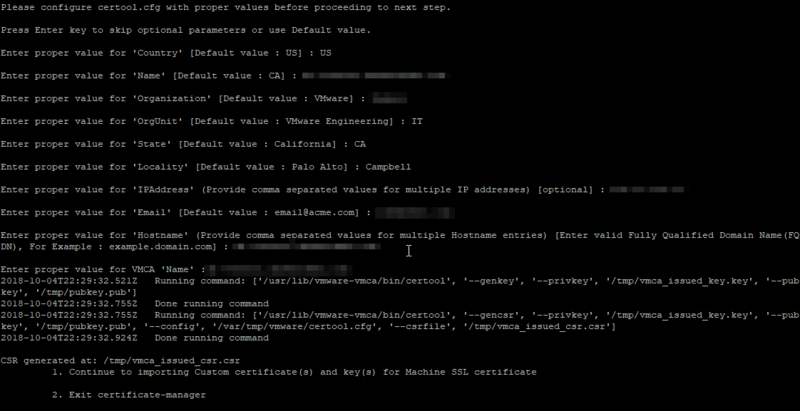 Enter SSO and VC administrator credentials (default: administartor@vsphere.local). And now, choose option 2 to import custom certificates. 14. Then specify the signed certificate, the private key, and the CA certificate location. 15. Select Yes(Y) to confirm the operation. This may take a few minutes. Engineer’s note: If certificate update fails due to specific plugin, disable the plugin and re-run import once again. 17. 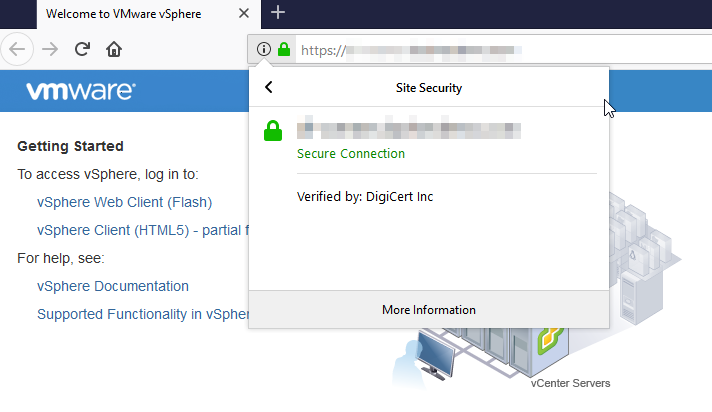 Once all services have restarted, connect to the Web Console with browser and verify your new certificate. After machine vCSA certificate is replaced, you may also find that vCenter VAMI is not accessible. Engineer’s note: You may also find useful to modify an alarm definition “Certificate Status” to send a trap or email if certificate is to expire soon. 19. Log in to the vSphere Web Client. 20. Select the vCenter Server object, then select the Monitor tab, the Issues subtab, and Alarm Definitions in the left column. 21. Find Certificate Status alarm definition, ensure it is enabled, and specify the actions to be triggered. 22. By default, 30 days threshold is configured. You can modify how soon you would like to be warned. 23. Select the vCenter Server object, select the Configure tab, and then Settings in the left side column. 24. Select Advanced Settings, select Edit, and filter for threshold. 25. Change the setting of cert.threshold to the desired value, and click OK.